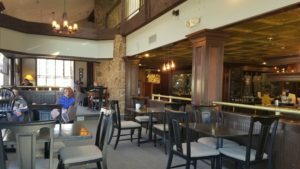 Kairos Coffee House behind Popes Bluff and Ute Valley Park. 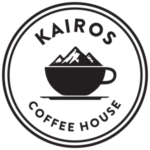 Kairos Coffee House was a last-minute decision we’re really happy we made. 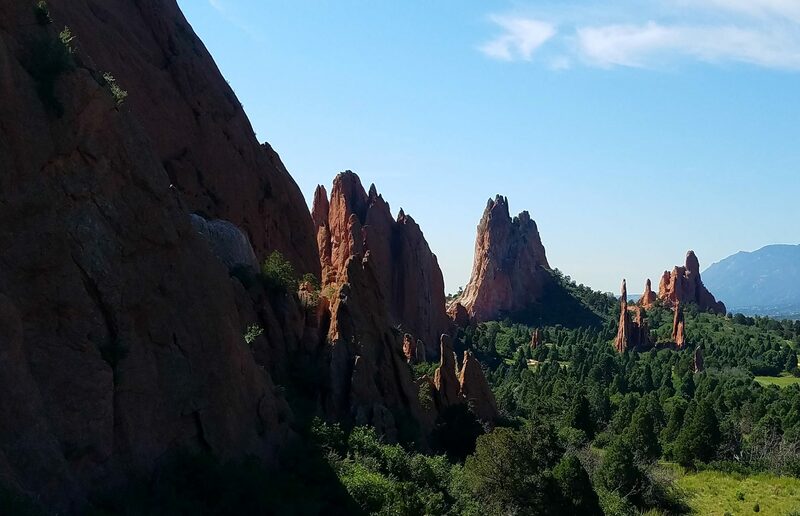 Colorado Springs natives may have noticed their sign along Garden of the Gods Road, but you can’t actually see the storefront from the street. In fact, it felt a lot like searching for the Isle of Tortuga from Pirates of the Caribbean: it cannot be found, except by those who already know where it is. Once you get inside, you’ll forget you’ve never been there before–because you’ll already want to come again. 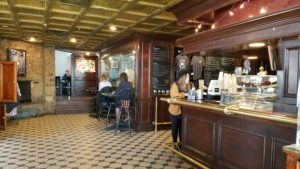 In the ’70s, this space used to be a bar, so the decor still has that cool, bar vibe with multiple levels, stone walls, and the baristas stand behind a bar that surrounds them on all sides. But it’s been transformed into a really cozy setting. Local art is hung on every wall, and there are tons of windows that let in lots of natural light. 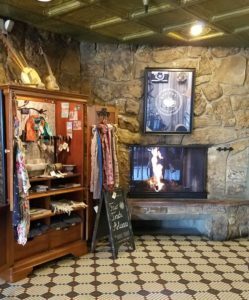 The fireplace near the entrance is open on two sides, so you can warm up on your way in, or pull up a chair on the other side with your coffee of choice. There are larger tables which make it great for study groups or a mobile office, and in fact, they encourage you to come in and make yourself at home with work, school, friends, or a good book. They even let you host events like baby showers, birthday parties, and corporate gatherings. Their menu has something for everyone. My next visit will include the London Fog! 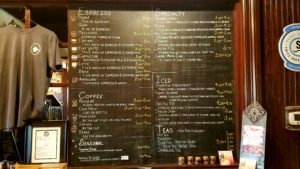 I had a regular vanilla latte which was creamy and sweet. I think I prefer it with a little more coffee flavor, so next time I might ask them to go light on the syrup. My husband had a Caramelicious and loved it. He had it with with four shots, so it wasn’t too sweet. Kid friendly: Yes – though it is quiet, so if your kids are prone to running around (like our 2- and 4-year-old), you may think ahead. 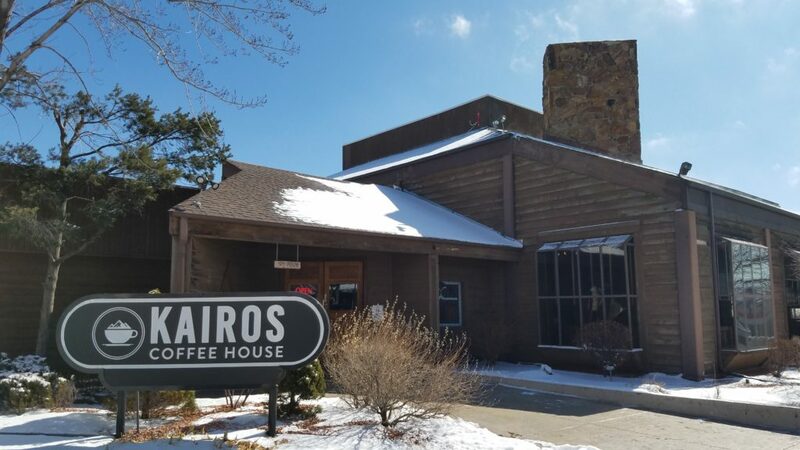 We give Kairos Coffee House a strong 9/10. If it was in a slightly different location it would get 10/10, but we’ll definitely be back.